Mutual Street Arena original opened as 'Arena Gardens' on October 7th, 1912, and remained under that name until 1932. Arena Gardens was the largest indoor arena in Canada at the time (1912), with 8,000 seats and a 230' x 95' sized rink. The designer was F.H. Herbert, and he worked for the architectural firm Ross and MacFarlane. The cost of construction was a little over $500,000. The original purpose of the Arena Gardens was suppose to be a new opera house, but the investors and builders figured that they would make more money if it were a professional hockey arena. The first person to put a professional Toronto hockey team into the arena was Frank Robinson, and his team was the Toronto Blue Shirts. The Toronto dailies (newspapers) at the time referred to the team as the Blue Shirts or, sometimes, as the Torontos. The team started playing in the arena in 1912. In 1915, E.J. "Eddie" Livingstone purchased the team, and made it the home team of Arena Gardens, until he was kicked out of the National Hockey Association. The team changed its name to the Toronto Arenas, under the new management, and was the first team to win the Stanley Cup in the newly reformed league, known as the National Hockey League (NHL). The arena housed the Toronto team through each of its incarinations: the Blue Shirts, Arenas, the St. Patricks (a.k.a. 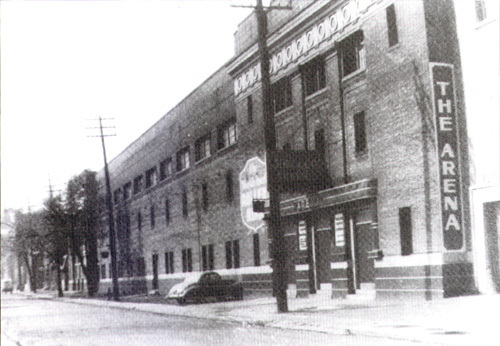 the "St. Pats"), and finally, when Conn Smythe purchased the team, as the Maple Leafs. All teams wore blue and white, except for the St. Pats, who were green and white. The first professional hockey game held in Arena Gardens was on December 25th, 1912; that night, the Toronto Blue Shirts first ever opponent was none-other than the Montreal Canadiens. Toronto lost 9-5 to the Canadiens. In November 1931, the Maple Leafs left the building for Maple Leaf Gardens, leaving Arena Gardens without a true purpose. No form of professional hockey returned to Arena Gardens, and the name changed in 1932. For the next fifty-seven years, Mutual Street Arena struggled to carry on other sporting events and exhibitions. Bicycle races, boxing, wrestling, tennis, boating shows, home shows, and swing/big bands came to Mutual Street to strut their stuff. Another name change for the arena arrived in 1962, when it received a $3 million face lift, that included a restaurant, a curling rink, and rebuilt east-side exterior and facade. The Mutual Street Arena's new name was The Terrace. By the 1970s, The Terrace became a roller rink to fit in with the times, but was rapidly losing its charm with the city. The final years were trying for The Terrace as the owners eventually shut down the building in the later half of the 1980s, left waiting for its demise. At the end of the '80s, new owners stepped in with plans to turn the building into condos and shops. Finally, in 1990, that is exactly what they did. Arena Gardens, a.k.a. Mutual Street Arena, a.k.a. The Terrace, was torn down and condos, shops, and co-op housing went into place. The only proof that Toronto's first hockey arena existed is a plaque on the site, hidden behind some outdoor plants in the parking lot of the condos (on the east side entrance), describing the story of Arena Gardens. Also, if you can walk around the park that is located on the site of what was the south end of the Gardens, you will find pieces of the original red bricks that made up the Arena Gardens's once-upon-a-time glorious facade. I'm in the process of drawing (space allotment) the layout of the Terrace.Thank you for supplying the rink ice dimensions "The Terrace."